On Thursday night the first results from Britain’s referendum on pulling out of the European Union came in. A small clue to the way things were going last night was the vote in the North East. People in Newcastle are known locally as 'takems' (said with a short a, like tack um); those in Sunderland are called 'makems'. It means that people in Sunderland make things and people in Newcastle take them. Sunderland is solidly industrial, while Newcastle, also a big industrial centre, is a market town. Newcastle voted to remain, but by the tiniest of margins. Sunderland voted to leave, 60-40. That was when we began to think that – not for the first time – the polls had got it wrong. As the night wore on the results came in, defying the pollster’s determination that the people would reject the referendum question and stick with the European Union. Of London Boroughs, Barking voted to leave, too. It was historically a ‘white flight’ borough, but today it is thronging with Poles and Africans. It is very working class. Islington, by contrast, was overwhelmingly for stay. Islington has working class wards, though these are mostly demoralised, and the borough deserves its reputation for being dominated by a precociously radical middle class. Most of all the vote is a popular reaction against the elite. 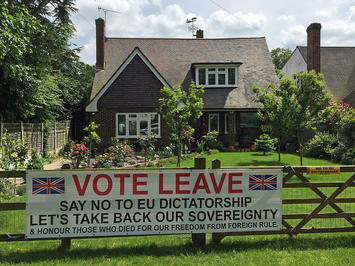 Their view that the European Union is not for them is right. I have taken students to the Brussels Parliament, which is a bit like visiting the offices of the IMF. The only people that you see hanging around outside and waiting to see someone, are themselves very haut bourgeois. By contrast, if you go to the Palace of Westminster, you will see large crowds of school children, nurses, veterans, and ethnic minorities. Parliament is often very bad in its decisions and its cliquishness, but the people do look to it in a way that they will never look on Brussels. That law making should have passed so silently and sneakily off to the European Commission is not something that ordinary British people approve of, and they are right. The British Labour movement protested against the Maastricht Treaty back in 1991 that created the EU, and had already been committed to a position of withdrawing from the preceding EEC. Labour's heartlands were in agreement. Over time, though, the temptation of the 'European Social Chapter', and the trade union leaders' resentment at the Tories opt-out of that did tempt some labour leaders (though not their members) to support the EU. That in itself is a symptom of the unions' loss of influence in their own right; they hoped that their European friends would offer them what their own campaigning could not. As the Labour Party became more distant, metropolitan and elitist, it sought to re-write the party's policy to mirror its own concerns, and also to diminish working people's aspirations for social democratic reform in their favour. They got rid of the socialist clause in the party's constitution, Clause 4, diminished union leaders' say so in making party policy, and, symbolically, they changed the party's position on Europe from withdrawal to positive support. For younger graduates in London who were the party's activists, that all seemed to make sense, but a chasm was opening up between the party and its working class redoubts in the Midlands and the North of England. There are many facets to this disaffection. People are angry about the NHS. Some of the mood of hostility towards Blair's government was attached to the Iraq War. Latterly, the question of immigration became one that the labour voters came to distrust the Labour leadership on. In private the Cabinet did indeed talk about encouraging wide scale immigration, with the ambition of making the Conservative Party unelectable, by creating a 'multicultural' country. In a telling moment in the 2010 election Gordon Brown was caught by a radio mike complaining about a voter whom he had been introduced to. ‘That bigoted woman’, he called her. Suddenly everyone could hear the snobbery in his prissy voice. ‘Bigoted’ here was code for common, uneducated, or perhaps even ‘unwashed’. The EU issue was initially raised by the United Kingdom Independence Party (UKIP), which is to say the grassroots of the Conservative Party, peeling away from David Cameron's leadership. UKIP in that way are a mirror image of the disaffection of the Labour vote. In time, UKIP candidates got some support in Labour constituencies. That was a clue that the disaffection of the Labour vote was about to form itself up around the referendum. Asked by pollsters why they had voted to leave the EU, some said it was immigration. But more said that it was the question of democracy. This is a word that seems to mean very little to the academics, government officials, constitutional lawyers and politicians, and yet, strangely, means a great deal to those whose access to it is most limited – the greater mass of the British public. Depressingly, the sulking metropolitans and ‘opinion formers’ (Ha!) dismissed this revolt of the lower orders as nothing more than race prejudice. But that says more about those that say it than those that it is said of. To them almost every expression of popular sentiment feels like fascism. They see fascism in the support for the English football team, and lurking in the bad tempered rants of ‘white van man’ as he makes his deliveries. An old drunk on a bus says something mean about immigrants and he is pilloried on YouTube and Facebook as the latest sign of incipient fascism. What they usually mean is that the common people have spoken, and spoken clumsily, without the tortuous manners of the intersectional left. But by and large the exiters were not angry with migrants so much as they were angry with the established order. A tipping point was the publication of a letter on the front page of the Times, signed by leading businessmen demanding ‘remain’. This came hot on the heels of the claims that all economists (the same ones who had told us that there was no danger of an economic meltdown in 2008) were for remain. Before that the leaders of all the major parties lined up to say that remain was the only viable result. Elsewhere in Europe we have seen this kind of consensus form up. The last time was around the proposed EU Constitution in 2004/5. As every respectable voice made it plain that the Constitution effectively making the EU into a superstate was needed, the ordinary people revolted. In referenda in France and Denmark it was rejected. The project was in tatters. The very solidity of the establishment behind the EU Constitution was the thing that sunk it. If this shower are for it, thought the mass of the people, then it must be rubbish. So it was with the EU referendum in Britain on 23 June. The solidity of the establishment case for staying was probably what decided the majority to leave. The ‘out’ decision leaves many questions. The traders have attacked the pound – well, they had made it clear that they did not like exit, so we can expect them to try to punish the voters. We will weather it, and the economy’s underlying strength will make them come back for sterling later on. Shame on them. It is by no means clear that the vote to leave will lead to an actual ‘exit’. The prolonged process of leaving set out in the EU Treaty is effectively a ‘cooling off’ period, and a confident political leader – perhaps Boris Johnson, the star of the exit campaign – might well be tempted by some reforms. The EU itself will be shaken by the vote, and there are already signs that its leaders are moving away from the Federal structure of the Union in favour of a looser, intergovernmental agreement, that would allow greater sovereignty for its member states. That much is just an obvious attempt to accommodate what is already a groundswell of opposition to the Union that is much wider than Britain, taking in France, Spain, Greece and Portugal. One thing is for sure: the vote shows that very few of the experts, the academics, the media, lawyers and politicians have any insight into the will of the people, or even understand the meaning of the words sovereignty and democracy. James Heartfield is author of The European Union and the End of Politics and an historian and political scientist based in London. Photo by flickr user Diamond Geezer licensed under Creative Commons.